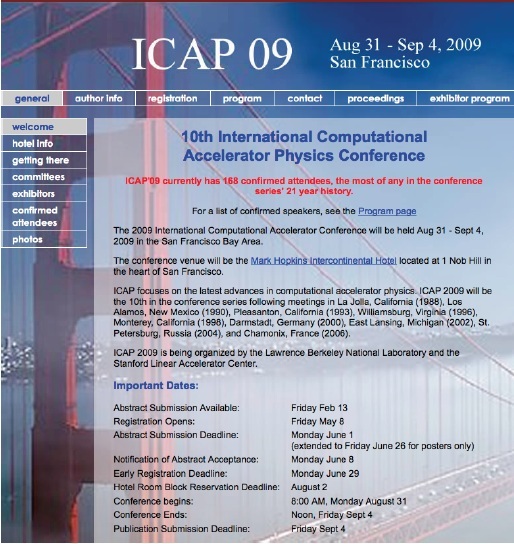 ICAP09, the tenth International Computational Accelerator Physics conference, was held August 31 through September 4, 2009, at the Mark Hopkins InterContinental Hotel in San Francisco, California, US. It was sponsored jointly by Lawrence Berkeley National Laboratory and SLAC National Accelerator Laboratory. With 168 attendees, ICAP09 was the largest event in the 21-year-old conference series. The program featured 115 talks and 61 posters, of which 51 talks and 32 posters are represented by contributions to these Proceedings. The links below take you to Portable Document Format (PDF) files containing the manuscripts and, for many oral contributions, the slides. The conference was sponsored by Lawrence Berkeley National Laboratory and SLAC National Accelerator Laboratory, supported principally by the U.S. Department of Energy. The contents were submitted by their authors under the expectation of public availability. The courtesy of source credit is requested.